The 5 day August war between Russia and Georgia changed the geopolitical and geostrategic scenario of Europe. It is important for many reasons. It was the first East-West conflict since the end of Cold War. It was the first European war since the Second World War, where the boundary of one sovereign nation was changed by force. 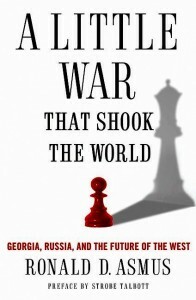 It was the rare instance where the USA took a backseat to the European Union in deciding how to solve a crisis, and most importantly it demonstrated the resurgence of Russia, and her turning back to autocratic tendencies and 19th century “sphere of influence” politics, after 20 years of military pacifism, Perestroika and self portrayed ignominy. “A Little War That Shook The World”, the last book by Ronald D. Asmus before his death, is for lack of better words, a must-read. It is the first, and so far the only draft of the history of an event which had repercussions across the globe, and continues to do so. It clearly suffers from purple patches, repetitions, and occasional diatribes, but in totality, it charts an event which ironically has been much neglected. And therefore, for students of politics, diplomacy, international relations and foreign policy, this book becomes invaluable for the insight and the firsthand account it provides. Mikheil Saakashvili is portrayed as a maverick — not the “hothead” the World media represented him to be — a leader whose only motivation was to take his country West towards greater Atlanticism and democracy, despite opposition from Russia. It also carefully charts with statistics the massive, disproportionate, and deadly counterattack of Russia, “something like hell”, determined to crush any opposition to its territorial ambition and influence and NATO’s westward expansion. The counterattack also sought to teach the West a lesson for the impunity and perceived injustice in Kosovo, which Russia regards as a tremendous injustice done to her. In fact, according to the author, it is the recognition of Kosovo a decade back, which started this eventual downslide to madness. The war was carefully planned by the Russians, premeditated, and decided for years. The August crisis was just a trap where the options were either a slow balkanization and disintegration of Georgia, or a war and forced amputation. Saakashvili took the latter. Also, the book is silent about the future of Atlanticism, and NATO. The internal problem of NATO started during the Balkan crisis, increased gradually with Iraq, Kosovo and Georgia, and came to the forefront, openly during the recent Arab Spring. Is the future of the alliance over? Because with each passing day it is just looking like a Cold War relic, an outdated bureaucratic super-state. Perhaps Ron Asmus, being the chief architect and advocate of an expanded and enlarged NATO couldn’t come to admit that maybe, his experiment was wrong. The newly joined states don’t have the democratic platform, free-market, or military prowess to join the alliance, much less carry the responsibility that comes with it. 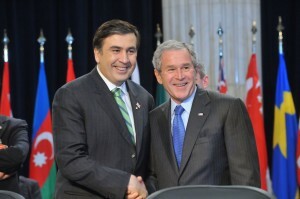 Mikheil Saakashvili, President of Georgia and then-President George W. Bush in April 2008. Why do I recommend this book then? Simply because, it is the only comprehensive book among a rare few written on this episode of history, which has not been much discussed and charted. Today when we see Putin about to come back to power, reforming the old Soviets and promoting Eurasianism, Russia Veto-ing sanctions against Iran and Syria, and warning of Nuclear war in its neighborhood if the expansion of NATO is not stopped, we remember that this course was already foretold a couple of years back.